Former CIA Director John Brennan says he's worried about President Trump's handling of North Korea, and he feels the possibility of military engagement is now "too high.". "I think the prospects of military conflict in the Korean peninsula are greater than they have been in several decades," he said during a Q-and-A session at Fordham University in New York Wednesday evening. "I don't think it's likely or probable, but if it's a 1-in-4 or 1-in-5 chance, that's too high." Asked whether that was how he'd rate the chances, Brennan responded, "Yeah, I guess I would." The public back-and-forth between Kim Jong Un and Mr. Trump is "not the way to de-escalate," he said, adding that he hoped Secretary of State Rex Tillerson is, as Tillerson has said, pursuing a diplomatic solution, perhaps through back channels in a way that could enable both leaders to "save face." 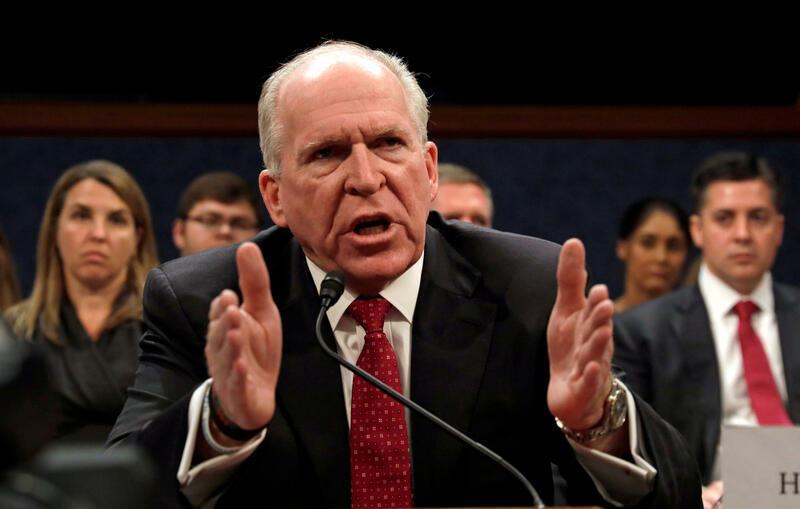 Asked about Russian interference in the 2016 U.S. presidential election, Brennan said, "It's hard for me to believe the Russians, as good as they are, as sophisticated as they are, a program like this -- were not able to get some Americans to cooperate with them either wittingly or unwittingly. I find it implausible." Brennan was also extremely critical of the president on several other fronts, including the Iran deal and the recent brouhaha over consoling gold star families -- those who have lost a family member on active duty in the military. On Iran, Brennan seemed incensed by the president's assertion that the U.S. got nothing out of the nuclear deal, the Joint Comprehensive Plan of Action (JCPOA). "He is either willfully ignorant of the issues, or willfully misleading the American people and the international community about what the deal was about," Brennan said. Brennan believes it's clear that these "are new and very difficult issues for Mr. Trump" and "he does not have the experience, the background, whatever, and I think there is a sense -- certainly among the people I talk to and the conferences I go to – that he is reacting to these issues in a spontaneous and impulsive way, without an understanding ... of what's involved." Brennan wondered, "Does Mr. Trump understand the JCPOA? Does he understand a lot of these other issues?" He also praised the three presidents with whom he worked for the way they treated families who experience the loss of a loved one serving in the U.S. military. Of Presidents Clinton, George W. Bush and Obama, Brennan recalled "observing them at times of great pain and anguish when lives have been lost, and the solemnity with which they treated those situations and interacted with families and loved ones, and just how important that responsibility was." All three, he said, "took it very responsibly, and I was very impressed that all of them acted so presidential in those cases." Mr. Trump earlier this week suggested that past presidents didn't always call the families of fallen soldiers. "I think one can highlight what they're doing, and the importance of what they're doing, without dragging down either predecessors or previous things," Brennan said. "To me, that's much more presidential as well as constructive. So I think some of the things that have taken place in the last 48 hours have not given the proper respect to the families." CBS News' Margaret Hynds contributed to this report.